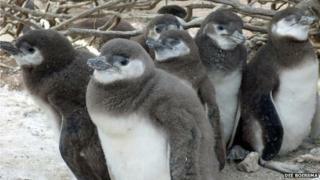 Penguin chicks in Argentina are dying as a direct consequence of climate change, according to new research. Drenching rainstorms and extreme heat are killing the young birds in significant numbers. The study, conducted over 27 years, looked at climate impacts on the world's biggest colony of Magellanic penguins, which live on the arid Punta Tombo peninsula. The research has been published in the journal Plos One. About 200,000 pairs of these penguins make their nests on the peninsula every year. They reside there, in desert-like conditions, from September until February to hatch their young. However, the life of a newborn chick is perilous, to say the least. They are too big for their parents to sit on top of and keep warm, but too young to have waterproof feathers. As a result, they are particularly vulnerable to rainstorms. If they get drenched they usually die, despite the attentions of their despairing parents. They can also succumb to extreme heat, as they cannot cool off in the water like the others. The new analysis of data from Punta Tombo indicates that climate change is having an increasing impact on the chicks. "Climate variability in the form of increased rainfall and temperature extremes, however, has increased in the last 50 years and kills many chicks in some years," the authors write in the report. In two years it was the most common cause, accounting for half the dead chicks in one year, and 43% in another. "It's the first long-term study to show climate change having a major impact on chick survival and reproductive success," said lead author Prof Dee Boersma, from the University of Washington. The number of storms at the breeding site in the first two weeks of December, when the chicks are less than 25 days old, has increased between 1983 and 2010. "Penguins live in the desert and what's really happening with these rain storms - they are turning their nests into swimming pools and they really don't like to be wet," said Prof Boersma. As well as more downpours, the researchers believe that altered fish behaviour is contributing to the rising numbers of deaths. Over the 27-year period, the penguin parents have arrived at the breeding site later and later in the year, probably because the fish they eat are arriving later too. The scientists say that the later in the year that the eggs are hatched, the more likely it is the chicks will still be at the vulnerable, downy stage Warming 'killing penguin chicks'when the storms arrive in November and December. "The birds are coming back later and on average laying their eggs three days later than they did a decade ago, so they have a shorter breeding season and that cuts down the amount of time they have to raise their chicks," said Prof Boersma. This year, though, the problem was heat, with several days over 30C. In the longer term, the outlook for this species in the face of a changing climate is not good, say the researchers. "We're going to see years where almost no chicks survive if climate change makes storms bigger and more frequent during vulnerable times of the breeding season as climatologists predict," said co-author, Dr Ginger Rebstock, also from the University of Washington. In a separate study, also published in Plos One, researchers found that changes in sea-ice were having an impact on Adelie penguins in the Ross Sea area of Antarctica. The authors found that under normal conditions, the penguins were successful at finding food at relatively low sea-ice concentrations and should be able to cope with predicted future changes. However, the researchers say that these penguins will have significant problems coping with infrequent, extreme environmental events such as the presence of giant icebergs. "Our work shows that Adelie penguins could cope with less sea-ice around their summer breeding grounds," said lead author Dr Amelie Lescroel from the French National Centre for Scientific Research (CNRS). "However, we also showed that extreme environmental events, such as the calving of giant icebergs, can dramatically modify the relationship between Adelie penguins and sea ice." "If the frequency of such extreme events increases, then it will become very hard to predict how penguin populations will buffer future sea ice changes."